CBC — Canada's future king and his wife, Kate Middleton, have left London's Heathrow Airport for Ottawa to kick off their first tour of the country. 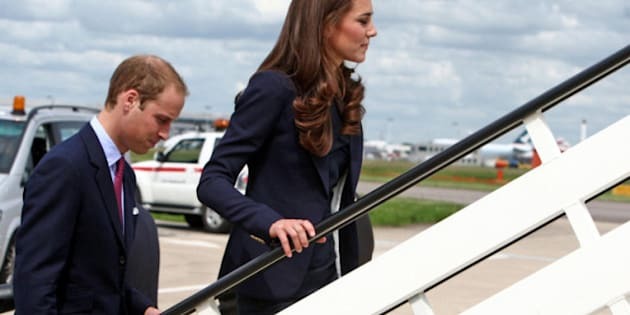 Wearing classic dark suits, Prince William and Kate, the Duke and Duchess of Cambridge, boarded a flight at 6:20 a.m. ET Thursday. Kate was sporting a navy blazer from Toronto designer Smythe les Vestes over a dress by French label Roland Mouret. 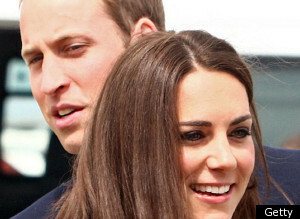 The royal couple is scheduled to land in Canada's capital at 2 p.m. aboard a Canadian Forces plane. Canada is the only Commonwealth country that flies Britain's Royal Family on its own military aircraft. Once they land, the couple will be greeted by Foreign Affairs Minister John Baird, Ottawa Mayor Jim Watson, RCMP Commissioner William Elliott and other dignitaries. William and Kate will head straight to the National War Memorial to be greeted by Prime Minister Stephen Harper and his wife, Laureen, at 2:30 p.m. to lay a wreath at the Tomb of the Unknown Soldier. They'll also meet the country's Silver Cross mother — a woman chosen to represent the mothers of all soldiers killed in service of Canada — and greet the public on the way to their car. Within 90 minutes of arriving on Canadian soil, the two will be on to their second engagement — at Rideau Hall for their official welcome to Canada. They'll be greeted by Gov. Gen. David Johnston and his wife, Sharon, then walk up the lawn to the front of the residence. RCMP Const. Julie Morell said Thursday morning that security and safety measures will be heightened during the royal couple's visit. "The RCMP has a lot of history of doing escorts for the Royal Family that we're very proud of. ... This is something we're prepared for." This will be the public's second chance to greet William and Kate before the prince inspects the guard and delivers three minutes of remarks. This is also where Canada will "break" or raise William's personal flag for the first time. William, last in Canada when he was 15 years old, will make a speech in his first remarks in Canada, at the Governor General's residence. It's expected William will speak French for part of his speech — on a day his mother, Diana, the late Princess of Wales, would have turned 50 and Canada turns 144. Kate, meanwhile, is not expected to speak officially on this tour. The afternoon portion of William and Kate's program ends two hours after their plane lands, giving them time to rest before joining 120 youth for a barbecue. Guests at the 6 p.m. barbecue include young Canadians who have made their mark serving their communities. The royal couple will meet and chat with them before everyone sits down for a meal presented by culinary students. The evening will end just before 7:30 p.m., giving them time to rest prior to launching Canada Day festivities on Friday with a citizenship ceremony. William and Kate drew the eyes of the world when they married in April, and Canadian officials hope their visit will showcase the best of Canada.